While most people are trying to figure out how to get rid of rust, there are those who like the look of it without the destructive properties. A rusted look can be accomplished by a technique known as faux finishing. There are different methods available to create a rusted effect, but the least expensive one is to simply use multiple colors of paint and ordinary sand. With these materials you can achieve a rusted effect on many items inside and outside of your home. Easy steps to paint a rust effect. Apply a coat of primer designed for all surfaces and allow it dry. Drying times vary for different brands of primer, which is why you should always follow the manufacturer's instructions. Paint a base coat of white acrylic latex paint on the object receiving the rust effect. Sprinkle clean sand over the random areas on the object while the paint is still wet, and allow it to dry for a minimum of 12 hours. Applying sand will give the object the look of oxidation or rough areas where rust forms. This step is optional, and is not absolutely necessary if you do not want the rough texture. Pick the object up and turn it over to allow excess sand to fall off of it before applying the next coat of paint. Apply dark brown paint to the object by stippling it on the surface. Stippling means to dip the brush into the paint and dab the paint on instead of brushing it on. Do not completely cover the object with the brown paint. You want to be able to see the base coat of paint and sand through the brown in random areas on the object. Wash out the paintbrush and stipple terracotta color paint on the exposed areas of the object that were not covered with the brown paint. Allow the object to dry overnight. Spray water on the entire object using a spray bottle. Use the stipple technique to apply gray paint over the entire surface of the object, and allow it to dry. The object will most likely need to dry overnight because of the water. The gray paint fades out the brown and terracotta paint, which gives the effect of rust beginning to form through the original metal. Spray the surface of the object with water and splatter orange paint on random areas across the object. The orange paint should be splattered on areas where rust would naturally form. Hold a paint stick in one hand, and tap the edge of the 1/4-inch paintbrush on the edge of the paint stick. The bristles should be overhanging the edge of the paint stick. This technique will give you control over where the splatters land. 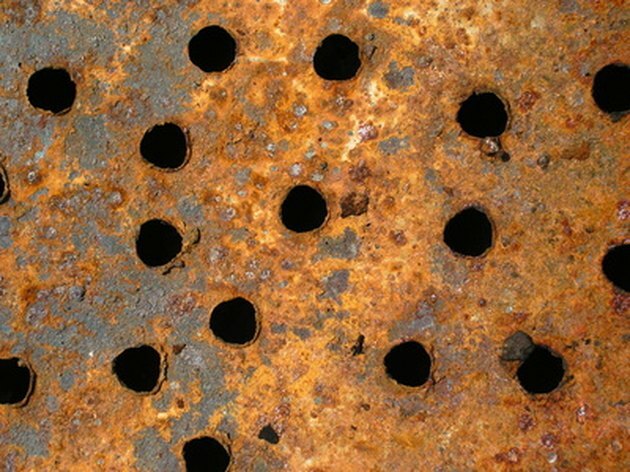 Natural rust formation usually occurs along the edges, and on ridges that might collect water. Dab the orange paint with a rag after you splatter it. Dabbing the paint will flatten the splatters and make them appear like the formation of rust. Allow the newly faux finished object to completely dry before placing it outside. Wait for 24 hours, or at least overnight. What Takes Off Green Stuff Off Copper?